Even though you might want to know how to get rid of wasps, there are some interesting things about these insects that might help you decide what actions to take. Globally, there are over 100,000 species of wasps, which includes yellow jackets and hornets. People are most often stung by wasps late in the summer when wasp colonies stop breeding new workers. The remaining wasps fly farther, searching for sugary foods, making it more likely for them to come into contact with people. Most adult wasps mainly feed on nectar, with a few omnivorous species also feeding on dead insects. Wasps swarm feed, so once a wasp has found a food source, it will return to the nest to recruit other wasps, where one wasp can quickly become hundreds. Some wasps can transport pollen and pollinate several plant species. While wasps can kill some beneficial insects, they can also help by eating crop-destroying bugs, like grubs, caterpillars, and weevils. Farmers will sometimes even use wasps as a natural pest control for their crops. Only female wasps sting, and though a bee can only sting once because its stinger becomes stuck in the skin of its victim, a wasp can sting an unlimited number of times because their stingers remain intact. Wasps sting if people respond aggressively and stings are usually more painful rather than dangerous, though those who are allergic should seek immediate medical attention if stung. When a queen starts to build a nest in the spring, it’s usually only about the size of a walnut. By the end of summer, when the wasp nest could grow to the size of a basketball, it can contain thousands of wasps. 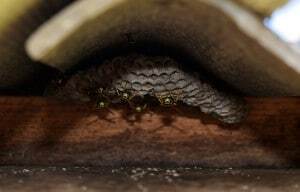 Common sites for a wasp nest include under roof eaves, behind shutters, or in garden sheds. The actual nest is not always visible; you may just see a hole in the wall, with the nest hidden behind the small entrance. Bug & Weed MART sells a directional, compressed aerosol product that allows you to be 15-20′ away from where the wasp lands. This allows homeowners to control wasps pretty easily. Stop in at any of our 5 Valley-wide locations and one of our managers can walk you through the process so you’ll know how to get rid of wasps safely.